December 28, 2018 By This post may contain affiliate links. 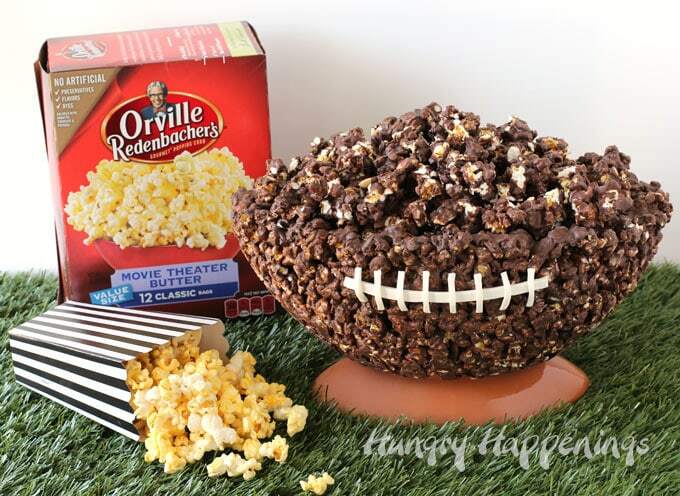 Score a touchdown when you serve a Chocolate Popcorn Bowl Football for the Big Game. Your party guests can enjoy snacking on chocolate popcorn filled with peanuts and toffee then they can break apart the edible bowl and eat it too. 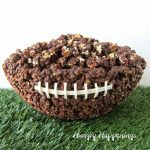 If you are looking for a dessert that will be as spectacular as the Big Game, this Chocolate Popcorn Bowl Football is it! Orville Redenbacher’s® Movie Theater Butter Popcorn is coated in milk chocolate then molded into a football shaped bowl and decorated with white modeling chocolate laces. Then the edible bowl is filled with even more chocolate popcorn which has been tossed with some peanuts and toffee bits to make it even more amazingly yummy. The football shaped popcorn bowl will be the hit of any game day party but you’ll also want to serve other snacks for all your hungry party guests to enjoy. I suggest popping lots of Orville Redenbacher’s Popcorn for everyone to munch on. It’s a quick and easy snack to make, has no artificial preservatives, flavors, or dyes, is the only leading brand of popcorn to use real butter, and your guests will love it. Orville Redenbacher’s popcorn is the best quality for the occasions that are most cherished. You can find 12 pack boxes of the microwave popcorn in the snack aisle at your local Walmart. You can serve Orville Redenbacher’s Movie Theater Butter or Ultimate Butter Popcorn in football themed paper cups, bowls, or popcorn boxes. For fun you can toss on some chocolate almond footballs. Did you know that in 1952, Orville Redenbacher hand selected a small group of family farmers to grow his exclusive kernel? Generations later, farmers like Richard Overmyer continue to grow that same special kernel that pops up lighter and fluffier than ordinary popcorn. To make your food table look festive for the big game you can cover the table in astro turf and use football themed partyware to hold your snacks. 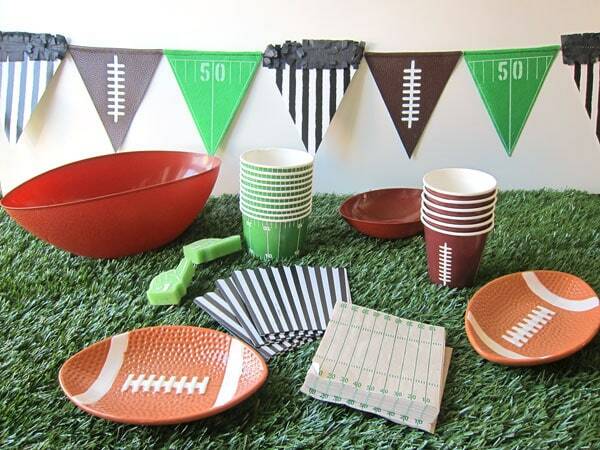 Add a few football themed decorations like foam fingers or football themed pennants to complete the tablescape. You can even dress up your snacks. I turned a bacon cheddar ranch cheese ball and a hot taco dip into footballs for my homegating party and served them alongside my popcorn and a few other snacks. If you want even more ideas for game day snacks be sure to check out Orville Redenbacher’s game day party ideas here. 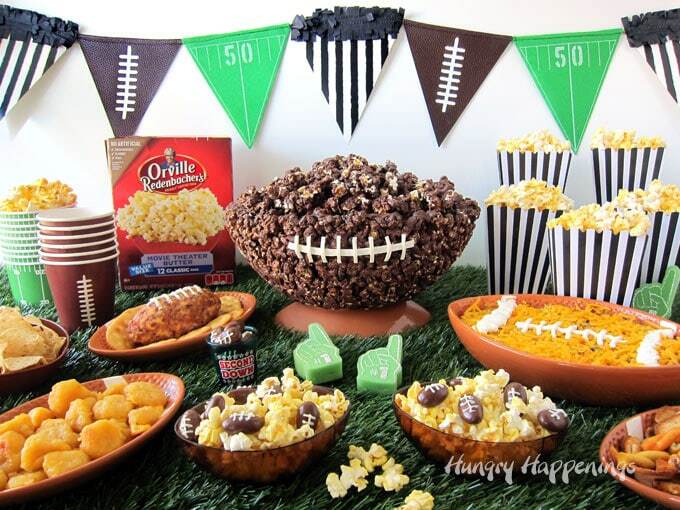 There are so many things you can add to your table to make it look festive but the Chocolate Popcorn Bowl Football will definitely be the focal point so let me show you how to make one for your big game party. If you need more instructions for melting chocolate be sure to check out my Chocolate Making Tips tutorial. Pop 1 bag of Orville Redenbacher’s Movie Theater Butter Popcorn. I like to pour the popcorn into one large bowl then I scoop out the popped popcorn using my hands and drop that into another large bowl leaving the un-popped kernels behind in the first bowl. 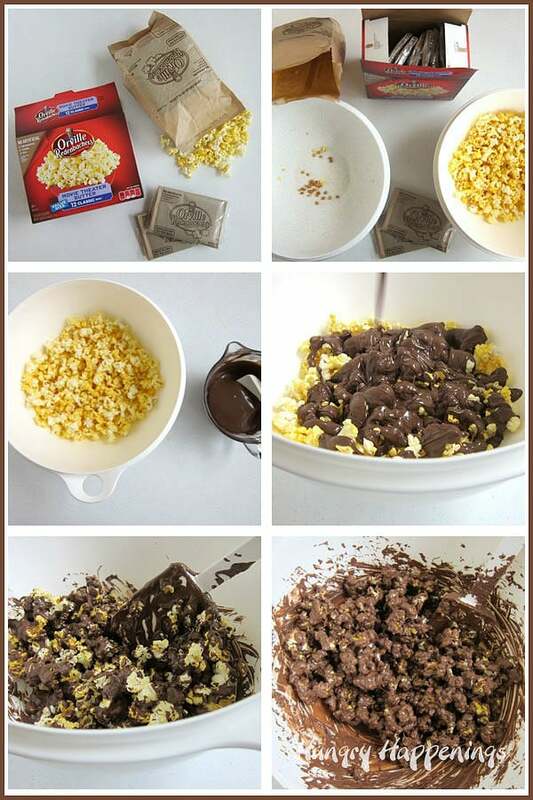 Pour 18 ounces of the chocolate over this popcorn and stir just until the chocolate coats the popcorn. Don’t over-stir the popcorn or the chocolate will begin to harden. Pour the popcorn into the plastic football shaped bowl. Be sure your bowl is shaped such that the top edge does not curve in towards the center of the bowl. You need the walls of the bowl to be fairly straight in order to be able to allow the popcorn bowl to slide out once the chocolate has hardened. You can line your football shaped bowl with non-stick tin foil for easy removal. That is what I did when I made my round White Chocolate Popcorn Bowl. It worked great. Press the popcorn into the bottom and up the sides of the bowl creating about an inch thick wall. The first batch of popcorn will go a little over mid-way up the sides of the bowl. 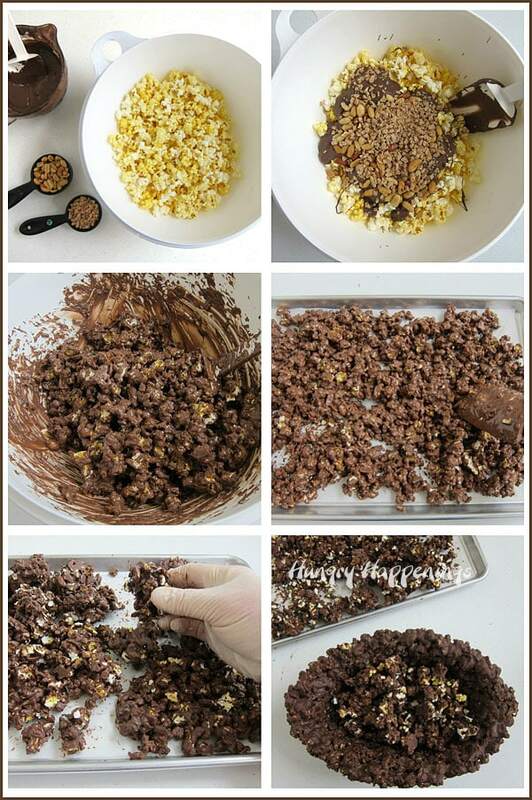 Pop the second bag of popcorn, remove the un-popped kernels, then coat with another 18 ounces of melted chocolate and start adding it to the upper part of the sides of the bowl. If the chocolate on the popcorn is warm the popcorn may slide down the bowl a little bit. Just keep working the popcorn onto the bowl. As the chocolate begins to harden you will find it easier to fill in any gaps in the bowl. Once the chocolate begins to harden, press down on the popcorn to really compact it on the bottom and up the sides of the bowl. 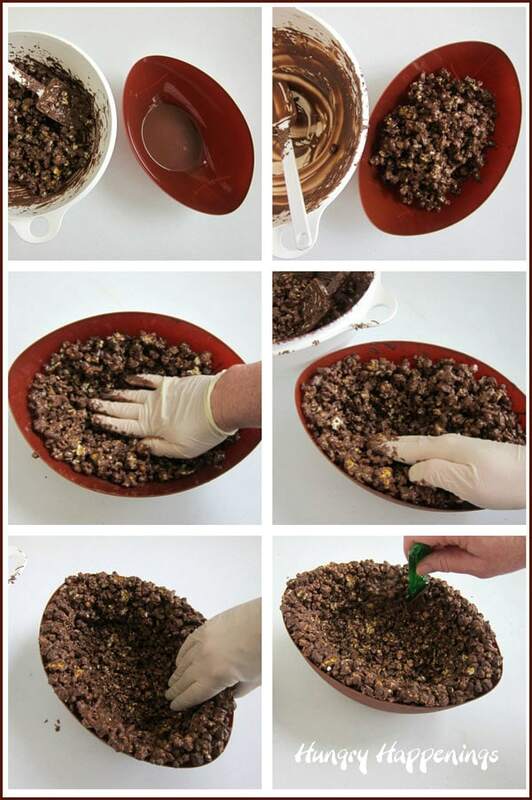 Brush the remaining 4 ounces of chocolate all over the inside of the chocolate popcorn bowl, making sure you fill in any big gaps. The pieces of popcorn at the top may need to be “glued” down using the remaining chocolate so that they stay in place. Place the football shaped bowl in the refrigerator for 30 minutes. Then freeze for 10 minutes (set the timer so you don’t forget it in the freezer). Run a thin spatula (I used a thin plastic blender scraper) or knife around the edge of the bowl to separate the hard chocolate from the edge of the bowl. Pull at the side of the bowl then turn the bowl upside down and push on the bottom and allow the popcorn bowl to fall out of the plastic bowl. You may need to tug at the bowl a little bit to remove it. Just don’t pull too hard or you can break the bowl. If needed, freeze for another 10 minutes and try to remove it again. This is where having a layer of tin foil in the bowl will really help with removal. You can just pull up on the tin foil and lift the popcorn bowl out. Pop another bag of Orville Redenbacher’s Movie Theater Butter Popcorn and remove any un-popped kernels. Add 1/2 cup of peanuts and 1/3 cup toffee bits to the popcorn. Pour 18 ounces of chocolate over top and toss to coat. Spread out on a parchment paper lined baking sheet. Refrigerate for 10 minutes until hardened. Remove and break into small pieces. Fill the football shaped chocolate popcorn bowl with this chocolate coated peanut and toffee popcorn. When you look at my photos you’ll notice my football isn’t completely rounded on top. I was fine with that but you can definitely add more popcorn if you like. 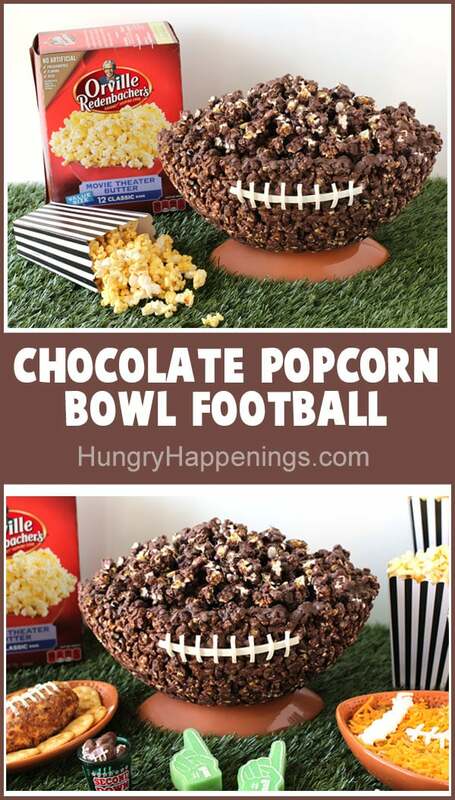 If you want your football to have a more rounded look on the top, repeat this process using one more bag of popcorn, another 1/2 cup peanuts, 1/3 cup toffee bits, and 18 ounces of chocolate. Pile more popcorn on top to complete the football. You will have more than you need. Find the modeling chocolate recipe, here. You can divide the recipe in order to make a smaller batch. You can also use fondant if you prefer. Roll out white modeling chocolate to about 1/8th inch thickness. Cut out one 5 inch by 1/4 inch strip and eight 3/4 inch by 1/8th inch strips. Use clear piping gel to attach the 5 inch long strip going horizontally across the chocolate popcorn football. Attach the remaining strips going vertically across the long strip creating the laces. OR make white chocolate laces. Fill a pastry bag with the white chocolate. Pipe white chocolate laces directly onto the popcorn bowl football. Allow the laces to dry before moving the football. It is best to make this popcorn bowl within 2 days of your party, but it will stay fresh for more than a week if stored in a large airtight container (if you have one that big). You can also store it in a jumbo sized zip top container to maintain freshness. 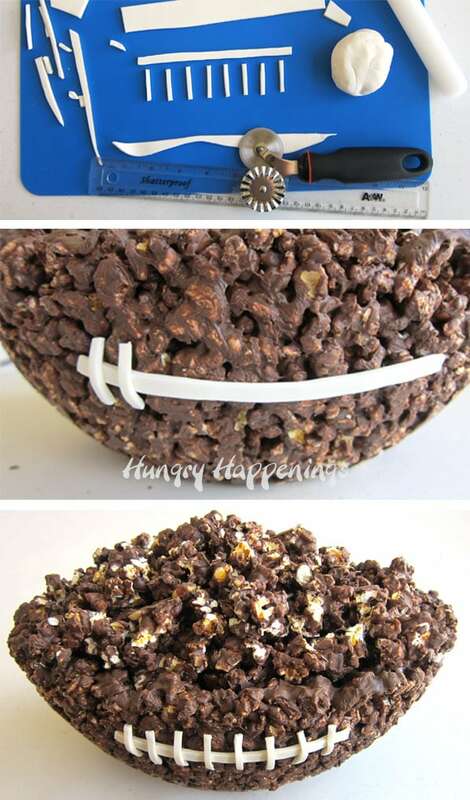 A football shaped chocolate popcorn bowl filled with more chocolate popcorn speckled with peanuts and toffee bits is decorated with white modeling chocolate laces and makes a spectacular centerpiece for you big game food table. Coat one bag of popped popcorn with 18 ounces of chocolate. Press into the bottom and up the sides of a large, plastic, football shaped bowl. Coat one more bag of popped popcorn with 18 ounces of chocolate and continue to press the popcorn up the sides of the football bowl. 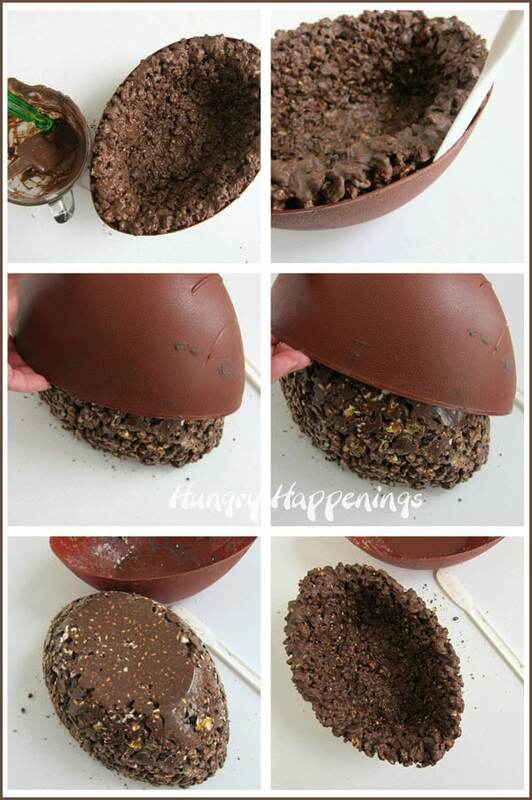 Brush the inside of the football shaped popcorn bowl with 4 ounces of chocolate. Refrigerate for 30 minutes then freeze for 10. Remove popcorn bowl from plastic bowl. Coat the remaining bag of popcorn, peanuts, and toffee bits with 18 ounces of chocolate. Spread onto a parchment paper lined baking pan and refrigerate for 10 minutes. Break the popcorn into pieces and place in the football shaped popcorn bowl. Decorate the football with white modeling chocolate laces. Roll out the white modeling chocolate to about 1/8th inch thickness. Cut one 5 inch by 1/4 inch strip and attach it to the popcorn bowl using clear piping gel. Cut eight 3/4 inch by 1/8th inch strips and attach them using piping gel going vertically across the 5 inch strip creating the laces of the football. If you prefer you can use melted and tempered pure white chocolate or melted white confectionery coating to pipe on the laces. You can find more football themed food that would be fun to serve for the Big Game, here. I love this idea, not only will this be great for game day, the bowl shape and colour could be changed to match other ball sports. Thanks Harriet! This could definitely be changed to make other sports balls. This is SO cute!! Love this idea for a game day party! This is so cool! Would be great for anytime of the year. Thanks, Amy! I agree. This would be so much fun to share with your Dad on Father’s Day, or your son when he makes the football team, or even your daughter if she makes the cheer leading squad. This is great! What a fun way to display a delicious snack! 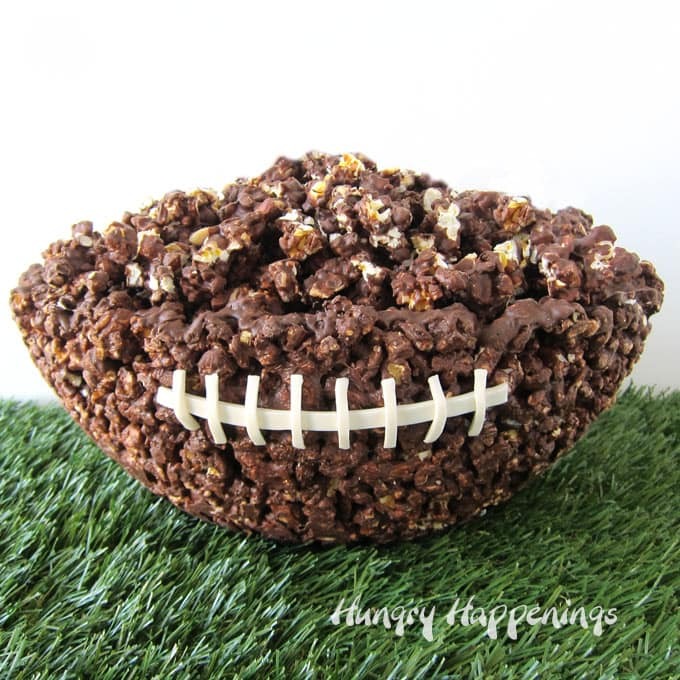 I’m so glad you like this Chocolate Popcorn Bowl Football! What an incredible idea! GENIUS! What an absolutely fun and delicious way to serve snacks for game day parties! Thanks, Jocelyn. It is really fun to serve at a party. My guests devoured this popcorn.